Fairfield, CT - The Connecticut Audubon Society Center at Fairfield, at 2325 Burr Street, invites you to prepare for the Spring Migration Season through its Spring bird seed sale, which benefits the conservation and environmental education programs at the Center at Fairfield. The Sale is set for Saturday, April 13, 10 a.m. to 3 p.m.
Bird feeding in the spring provides supplemental nourishment that birds need to recover from their travels. If migrating birds arrive at well-stocked feeders to “re-fuel,” they will not only stay for the summer, but will probably return next spring. The backyard where they raise their young will be their destination when they return the following year. Just in time for spring migration, the Connecticut Audubon Society’s Center at Fairfield, located at 2325 Burr Street, will offer a bird seed sale, Saturday, April 13, from 10 a.m. to 3 p.m. All bird seed sold at the Center’s Nature Store will be 20% off! What to put on the menu for your feeders? Sunflower is the most beneficial seed because of its protein content. Besides sunflower, mixed seed blends, nyjer and mealworms are all springtime favorites, as is no-melt suet which is a great energy source. The Center at Fairfield Nature Store offers a wide selection of seed for attracting the greatest variety of birds to your feeder. 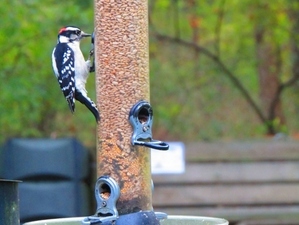 Along with knowledgeable staff to provide guidance on seed choice and feeder selection, the store has everything you need to enjoy backyard birding—from squirrel-resistant feeders to hooks, poles, baffles and field guides. Bird walks and talks are also offered year round at the Center. All programs and sales support Connecticut Audubon’s conservation and environmental education programs in Fairfield. The Nature Store is open Monday through Saturday, 10 a.m. to 3 p.m. For more information visit ctaudubon.org/center-at-fairfield, or call (203) 259-6305, ext.109. To ensure adequate supplies are available, pre-ordering is strongly recommended; pre-order forms are available online and are due April 3.